In 1981, Anna Mae Mc Quaid and Ronald V Mc Quaid started SeaCure Moving, Inc., a small moving company along the Jersey Shore that offered customers the same professional services that the larger movers offered, but with that added personal touch of a family owned and operated business. They brought over 25 years of experience in the industry to their new company plus that added family touch to build SeaCure Moving, Inc., by the “Sea” to “Cure” your moving needs. Anna Mae and Ronald realized that when you’re moving a family that you are such an important part of that person’s life, but only for a very short time, so you must make a positive lasting impression. We continue to instill the ideals of Anna Mae and Ronald in our employees today. This is what has made us South Jersey’s premier moving and storage company. We offer full-service local and long distance moving and storage services. We have packing and crating crews and now service all of New Jersey. We have grown into our 3 warehouse locations in Ocean County and Monmouth County, New Jersey. We offer overseas shipping and we have expanded our warehousing for receiving and distribution. Now with the second and third generation operating the business, and raising a fourth generation, we are proud to continue what Anna Mae and Ronald started in 1981. We still provide that personal family touch that makes our customers come back or refer their next generation to move with our next generation. In 1987, the decision was made to expand our interstate moving opportunity and sign as an agent for possibly the most recognized name in moving , Bekins Van Lines. 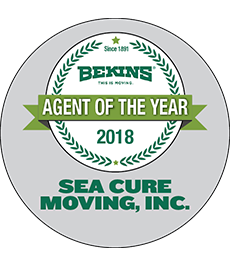 And since our partnership with Bekins began, our company had continued to grow, and SeaCure Moving’s commitment to our customers has been backed by the oldest name in interstate moving, Bekins ever since. We are proud to be the most recognized moving company in the areas we service, and we are proud of the reputation we have established. We are committed to Excellency, and we will continue to strive for perfection in our industry.